ROYAL BRIERLEY Crystal OLD FASHIONED Glasses "ASCOT" Pattern DISCONTINUED 3.5"
PERFECT CONDITION - ROYAL BRIERLY OLD FASHIONED GLASSES/ COCKTAIL GLASSES. ACOT PATTERN WHICH HAS BEEN DISCONTINUED. Etch Signed on the bottom of both goblets. Very good condition -the only flaw is a small scratch on bottom of one goblet, could be from production?. - see photo. These goblets do not appear to have been used. Tiny bubbles and flecks can be seen within the glass which are original to the crystal. This patterns have vertical lines above the cross hatch diamond pattern, glasses have a plain base foot. See all 12 photo's for detail. ROYAL BRIERLEY- HONEYSUCKLE. Etched and cut crystal bowl. clean clear crystal. Etched "Royal Brierley" on the bottom of each glass. These are large glasses, filled to the brim they hold 20 fluid ounces. THEY LOOK NEW. THEY ARE APPROX 7" HIGH AND 3 1/2" ACROSS FOOT. EXCELLENT SET TO ADD TO YOUR CIOLLECTION. I WILL GET BACK TO YOU AS SOON AS POSSIBLE. Fabulous addition to your Collection! Be sure to add as to your favorite list! Excellent pre-owned condition with minimal or no signs of use. BEAUTIFUL SET OF 2 CRYSTAL CLARET WINE GLASSES BY ROYAL BRIERLEY IN THE COVENTRY PATTERN. It is etched Royal Brierley on the base and has the. original sticker still affixed. Nice clean and clear glass…great addition to any collection. No discoloration in the glass…appears unused. We Do NOT Black light Test Glass . Condition is excellent. We do not wash or polish anything. Our goal is that you will be fully satisfied. We will provide instructions. Fabulous addition to your Collection! Be sure to add as to your favorite list! Excellent pre-owned condition with minimal or no signs of use, almost like new. Royal Brierley Fuchsia Crystal Candlestick Holder about 7 1/4” tall. Royal Brierley Crystal. Base acid etched with "BRIERLEY". Bruce Sugar Shaker & Lid; EPNS Lid. 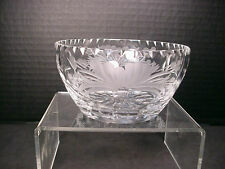 ROYAL BRIERLEY ~ SMALL ETCHED CRYSTAL BOWL for DESSERT, BON BONS, FRUIT OR FINGERS. MADE BY ONE OF THE OLDEST CRYSTAL GLASS MANUFACTURERS IN ENGLAND. We have available for sale a MINT CONDITION Royal Brierley crystal wine goblet in the Gainsborough pattern. It stands 5.5" tall. Perfect condition! The bottom is etched "Royal Brierley". Royal Brierley English Crystal Vanity Lidded Jar Paperclips Desk Office. Shipped with USPS Priority Mail. Royal BRIERLEY cut crystal wine glass in the COVENTRY pattern. Condition : excellent conditioning with only very light (if any) signs of use. Signed on the bottom “Brierley”. Kindly-houseosurplus . ROYAL BRIERLEY FOR TIFFANY&CO. Discontinued swag pattern by Royal Brierley exclusively for Tiffany & Co. gorgeous, solid, deeply cut crystal glasses. Royal Brierley Limited Edition Etched Music Notes Champagne Flutes, 12 1/4"
Listed is a rare set of two (2) Royal Brierley Limited Edition Etched Music Notes Champagne Flutes. These are acid marked on the foot and the condition is very good pre-owned condition with cracks or significant marks but one has a tiny flea bite on the foot - see last photo. Water Wine Goblets 5 1/2" High. Four Pieces. nice finish. 2 ROYAL BRIERLEY Crystal OLD FASHIONED Glasses "ASCOT" Pattern DISCONTINUED 3.5"
Pair of Royal Brierley Crystal "Ascot" Old Fashioned Glasses . . . Manufacturer: Royal Brierley Crystal Pattern: "Ascot" (Discontinued) Description: Pair of old fashioned glasses in the "Ascot" pattern by Royal Brierley. Bottoms are etched "Brierley". These glasses are very hard to find. Replacements lists them for $30 each. Measurements: Approx. 3.5" tall x 3" diameter Condition: Glasses are in excellent pre-owned condition. Please feel free to contact w/concerns or questions. Visit My eBay Store to View Over 600 Unique Collectibles & Fine Jewelry! Disclaimer: All items are sold "AS IS" in pre owned condition, unless otherwise stated in the description. We try our best to present an accurate description of the item, noting any imperfections or damages we may see. Acid-etched makers marks. Larger 6 1/2" length, 3 5/8" height. Smaller heart 1 1/2" height. ROYAL BRIERLEY CRYSTAL COVENTRY WATER GOBLETS - SET OF 8 - DISCONTINUED - NEW ? 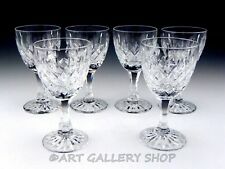 BEAUTIFUL SET OF 8 CRYSTAL WATER GOBLETS BY ROYAL BRIERLEY IN THE COVENTRY PATTERN. They are both signed (see photo) "Royal Brierley". I have not identified the pattern but it is a swag, or drape, pattern. Royal Brierley made one for Tiffany but I don't think this looks like it. This set is pre-owned and may have been used. BEAUTIFUL SET OF 2 CRYSTAL CLARET WINE GLASSES BY ROYAL BRIERLEY IN THE COVENTRY PATTERN. THESE BEAUTIFUL CRYSTAL WINE GLASSES ARE IN EXCEELENT CONDITION AND ARE GETTING HARD TO FIND AS THE PATTERN IS DISCONTINUED. Missing the original lid. Comfortably holds one U.S. cup when filled to the base of the rim (3/4" below top edge of jar). The cut glass pattern includes horizontal rows of upright leaf shapes, a 2 1/2" border of beveled diamonds, and a 16-point beveled star at thebottom. Really nice crystal candlestick signed Royal Brierley measuring 3 inches tall. No cracks chips flea bites or other issues with this candlestick. Perfect holiday gift for the crystal collector or hostess. Please ask questions now as this is an auction and final sale and payment is due within 3 days of the auction going off. Thank you! Royal Brierley lead crystal pedestal compote bowl centerpiece. High 8 1/8”, 6.25” Wide at the top, 5.25” wide pedestal base, bowl depth is 5.5”. The bowl is signed on the bottom of the bowl pedestal in the center, see the last picture. Please review the pictures as they are of the actual item you will be sent. The pictures show the condition of the bowl. Excellent condition no scratches, chips, stains or cracks or the outside or inside. There are some scratches on the bottom of the pedestal, consistent to age. Please let me know if you have any questions. In perfect condition. This pitcher stand just a bit under 3". This is Royal Brierley for Tiffany & co. Crystal Clear Glass Pitcher. Marked "BRIERLEY" etched on bottom - no Tiffany mark. Beautiful crystal Pitcher - Swag Pattern. New in original box Royal Brierley Millennium Celebration Edition "Stars and Stripes". There is no other piece like this for sale anywhere nor can you find more than one picture of this item on the entire internet (at least when I looked). Vintage English Royal Brierley Lead Crystal Vase. Beautiful handmade lead crystal bud vase with original tag. Apprx 3 1/4 x 2 5/8 inches. Please see pictures for details. From a smoke free home. Shipped with USPS Priority Mail. Lovely little open sugar bowl from Royal Brierley in the Gainsborough pattern. Set of 4 Royal Brierley Crystal Cut Small Stem Wine Glass. Very minor scratches. There may be a problem that we are not aware of and we would like the opportunity, if possible, to make things right for you. Maker’s mark on bottom of both. Great condition, never used. Excellent Condition, signed. 4" x 3".